Planning your way to success is not something that is difficult, but it’s something that has to be deliberate in order to happen. I have been studying women who have been making five and six figures every month, and because of them, the idea of my own success has radically changed. They seem to have the financial success of the woman described in Proverbs 31. For an aspiring Proverbs 31 woman, success is in every area of life. What I’m talking about today is the financial and business areas of success. A side effect of a successful business is wealth, so let’s start planning your success! Everyone who works hard deserves to be wealthy. I’m all about people getting rich. There is so much money out there floating around with your name on it and all you need to do is find it. Anyone who creates their own wealth doesn’t get rich by accident, that wealth came with a plan. We all need to be wealthy, let’s face it, prices are about to get a whole lot more inflated and in order to not just survive, but thrive, we will need great wealth. To create wealth, we can’t be stuck with only an income that has limits, we need an income source that is limitless. Wealth isn’t important to buy a bunch of stuff but to properly take care of our families and others. We should be able to buy a house or a car debt free, but even more than that we shouldn’t ever have to live paycheck to paycheck. In order to make it in this day and age, we need to be hyper-successful. I want you to write yourself a big fat juicy check. About five years ago, I wrote myself a check for $225,000,000 and put it in my empty safe. I certainly didn’t have an extra quarter of a billion dollars lying around, but that check number was the amount of money I wanted to be able to write myself one day without putting a strain on my finances. It wasn’t until recently that I had begun planning for that dollar amount. I really had not done anything about that check directly since I wrote it, it was just sitting in my safe as a dream. Honestly, I could not wrap my mind around the fact that the astronomical dollar amount I wrote on that check could be a reality in my bank account, that is until I started reading blogs where women were on track for this kind of success. I’ve always been hustling to be successful, I’ve had tastes of success, but I have not been the million-dollar kind of successful. I don’t know if it’s because that check that has been sitting in my safe, or if preparation is meeting luck, but I am finally seeing that 225 million dollar check as a reality instead of a dream. Somehow by writing that check, my dream became a reality inside of my mind. In order for something to become a reality, it has to first become real in your thoughts. So let’s not waste any time, let’s do this! Go get a check and write a dollar amount that you want to be able to give to yourself, and hide it away in a safe place. Whatever dollar amount you chose, make it big, make it so juicy and delicious that you will want to lick your fingers after you are finished writing it. When writing this dollar amount, know your worth, and then charge interest. The best way to light a fire under your but to get rich is to know your why. Why do you want to be rich? Your “Why?” is what you will turn to when you feel like giving up, or when the alarm goes off at 4:30 am and you feel like pulling the covers over your head. Your “Why?” is what keeps you going. Make your why something super important to you. I determined my “Why?” by studying Proverbs 31. I wanted to be all of those things the Proverbs 31 woman is because God’s word said I could. I want to be a Thirty-One Mom for my family, my family is my why. Money in and of itself is not evil, the love of money is. I’m not interested in making money to just buy stuff, I want to make sure that my family is well taken care of. Lack of money can be a real point of stress and contention when you don’t have it, I know this first hand. A Proverbs 31 woman has all the money she needs and more, verse 21 says, She is not afraid of the snow for her household: for all her household are clothed with scarlet. I don’t know exactly what scarlet is, but I’m guessing it’s expensive! The note on my King James Version of the bible says that scarlet is double. DOUBLE costs twice as much as single. Now that we have our “Why?” let’s figure out the “how”. How exactly are we going to become so rich that we can write multi-million dollar checks to ourselves like we are buying mid-range designer bags? Prosperity comes from figuring out how to use your gifts and talents to help people. It is so fulfilling when we can help others. I truly believe that every person on earth should have an online presence and an online business. We are all created so uniquely, that everyone can have a successful money-making blog and we wouldn’t even be in competition with each other. Online we can sell our tangible goods or digital products to anyone anywhere in the world. In a brick and mortar store, we are mostly limited to who can physically shop at our location. Doing business online just makes sense. Don’t just pick something because you think it will make money. Pick something you are passionate about because you will have to pour your heart and soul into it in order to be successful. Once you eat, sleep, and breathe this area of expertise, you will have no choice but to be successful. I made finding my niche more difficult than it was. I’m a multi-passionate person so I naturally tend to have quite a few areas that I wanted to put my focus. I wasted a few years by wondering and not knowing exactly what my life’s purpose was. Once I stopped wondering and started applying the following exercises, my path, niche and product became crystal clear. Each day, I’ve noticed I’m narrowing my focus and applying my other interests to build this one area of expertise. You can always narrow down your focus as you go, the important thing is to start. Done is better than perfect, and that advice is coming from a type A personality. Once you have your dollar amount nailed down, and your multimillion dollar idea, the fun begins! Have a creative brainstorming session. When brainstorming, write it down on paper! I love digital, I’m a digital diva, but nothing replaces good old paper and pen. Draw and make your ideas colorful. Writing your ideas down on paper really helps, you unleash your creativity. Draw pictures with your plans. It may be rough, it may be ugly, but that doesn’t matter. Just dig in and get creative. Sometimes the beginning stages of creativity can be ugly, don’t worry, the end product will be beautiful. This exercise is to get you to think outside the box, and expand your ideas. How do I start planning? Planning is really just a series of questions you ask yourself and action steps to answer them. Make a plan for everything that you want to be successful. There is something about the act of putting pen to paper that makes things happen. Your plan starts with a written idea or a goal. Once you have an idea, skip right to the end result. Think hard and deep, define what you want to achieve and then design the roadmap to your success. It’s all in the details. Make your plans detailed, the more detailed your plans are the easier they are to follow. If you wake up with a loose plan, your day will surely slip away from you. Plan a year in advance. This is your business plan. A business plan is a roadmap to success. A business plan doesn’t have to be in-depth or all kinds of technical in the beginning. Just get some plans on paper and you can build it from there as your business takes shape. Plan a month in advance. This is your editorial calendar, things you want to learn, things that you will implement to start making money. Your month planning should be in your favorite planner, or on a plain old calendar, whatever brand, and style that works best for you. I like to plan a month on two pages, Filofax is my planner of choice, but that’s a whole other blog post. What needs to be done this week? Your weekly plan will be more in-depth than the monthly plan, yet not as detailed as your daily plan. This is your daily top 5. Your daily planning can be as small as a top 3. I like to plan a top 5 because I do a minimum of one thing for the business (Usually, it is 2 things for the blog and the other 3 things on my list are personal and family to do’s). Once you start planning things, you will love it. You are planning your multimillion dollar success, what’s not to love? We are not always on top of our game, like an athlete who peaks just in time for a big competition, we can’t expect to always be “on”. Once we have our month planned out, all we have to do is follow the plan, and we can spend our time being creative instead of trying to figure out what we need to do when. If you have a written plan, you are going to feel obligated to follow it. Why go through all the work creating a plan if it is just going to sit around doing nothing? I love to sit down every evening before I go to bed and write down my top five. I wake up super early in the morning, I’m half asleep and under the warmth of my covers, I can easily start wasting time if I didn’t have my top 5 sitting at my computer waiting for me. I love how that little list makes me so productive in the morning. 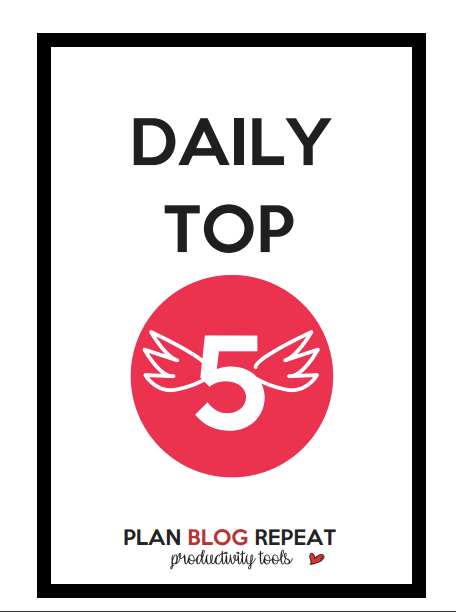 I’m adding a free printable of of one my Plan Blog Repeat Productivity Tools, my Daily Top 5 just for you! Be sure and get your download it at the end of this post. Money can’t buy happiness, but poverty can’t buy anything! So what are you waiting for? Get out there and start planning success! Say hello in the comments, I’d love to connect and hear some of your plans. Love this! I think it is easy to make excuses for why we aren’t financially successful, including equating money with being evil or wrong. I firmly believe the best way to help others is to make sure you are on solid ground first. Great post! Thank you, Amy! Great insight, I also believe that excuses are a form of self-sabotage. Why people (myself included) do that is hard to understand. I absolutely love this post. Write it and make it plain. So many times we see the visions but never take the time to plan the vision. Thanks for laying out the steps and making it plain for all of us who struggle to plan out success. Hi Andrea! You’re welcome, I think planning is one of my favorite things to do. Sometimes I get sidetracked too, but then I find some inspiration and get back on my planning wagon. ? I always notice, the more detailed my plans are, the more I get diligent about planning, the more organized and successful I become, and that is a great incentive to keep at it.